ALEXANDRE JULIEN DUCHENE was not even four years into a fourteen year sentence in Van Diemen’s Land in 1840 when Major D’Arcy Wentworth, the Police Magistrate at Launceston, described him as ‘a man of most exemplary conduct’. Edward Hammond Hargraves, was less than two years into enjoying his claim to have started the Australian gold rushes, when, in 1852 D’Arcy Wentworth’s brother, W C Wentworth, a member of the New South Wales Parliament, described Hargaves as an ‘imposter’ in support of George McLeay’s opinion that Hargraves was ’a shallow and impudent pretender’. After conducting a highly successful business in Launceston, Duchene moved to Melbourne in 1848 and became involved in the discovery of a rich goldfield in the Pyrenees Ranges, about three days west of Melbourne, but he decided not to dig for the gold. Instead, he publicized the discovery in the press, gave detailed directions to gold seekers, and applied to the government for a reward and appointment as Goldfields Commissioner. Port Phillip Superintendent Charles La Trobe quickly acted to disperse the gold rush and later consulted with Governor Charles Fitz Roy, who refused Duchene his reward and commission, but secretly asked London to send a qualified minerals surveyor to ascertain the truth of such reports, not only at the Pyrenees, but also closer to Sydney. Rejected by the government, Duchene sailed for California in April 1849 and was soon followed by Edward Hargraves, who was desperately looking for an easy way of making money—something that had eluded him for years. Coincidentally Hargraves visited the Californian Goldfields at the same time as Duchene, and met people who willingly shared their knowledge, and secrets. On the goldfields Duchene willingly shared how he found gold ‘three or four days journey from Sydney’ (most Americans had never heard of Melbourne) and had unsuccessfully sought a reward and government appointment. By remarkable coincidence, or perhaps not, Edward Hargraves now decided he would return to Australia where he would not only look for gold west of Sydney, but also ask for a reward and government appointment. In January 1851 Hargraves travelled three or four days from Sydney, and with the help of others, found widespread indications of gold. Like Duchene, he decided not to dig for the gold himself, but publicized the discovery in the press, and gave detailed directions to gold seekers. Like Duchene, he also applied to the government a reward and appointment as Goldfields Commissioner. Instead of immediately acting to protect the gold field, as La Trobe had done in 1849, Fitz Roy consulted with his newly-arrived surveyor, but by then was too late to disperse the rush instigated by Hargraves. Nothing could be done but allow the goldfield to be exploited. Within months the value of the goldfield originally reported at the Pyrenees by Duchene was also confirmed. In the end, Hargraves’s wish was granted; Duchene’s was not. This book looks at the lives of Duchene and Hargraves, lived entirely separately, until they both arrived in San Francisco towards the end of 1849. It also looks at the reasons that Duchene was considered ‘a man of most exemplary conduct’, while Hargraves was dismissed by many as an impostor and impudent pretender. Importantly, this book also raises the question of whether Hargraves developed his plan to look for gold west of Sydney only after hearing about Duchene’s earlier quest. Reviewed by Babette Smith, OAM, Adjunct Lecturer in History, University of New England; author of Australia’s Birthstain; A Cargo of Women: Susannah Watson & the Convicts of the Princess Royal; and The Luck of the Irish. “Far from noting geological features in California that were similar to Bathurst, as he later wrote, Hargraves almost certainly heard Alexandre Duchene’s story of his 1849 discovery and his rejection by the authorities in Victoria when both men were on the same goldfield in California. … Duchene’s find in Victoria started a ‘rush’ which was quickly squashed by Lieutenant Governor La Trobe. The Frenchman received no reward and his application for appointment as Gold Commissioner was rejected. A year later, Hargraves by comparison triggered an unstoppable ‘rush’ and gained credit as well as reward for his ‘discovery’. No small factor in his success was how he ensured that the rush started on a grand scale before he negotiated with the authorities. “This is no simple story however. The detail Wilkie has uncovered reveals a complex situation in which politics, economics, greed and self-aggrandisment all played their part. Politically the separation of Port Phillip from New South Wales (1850) was a factor of local significance. London on the other hand was concerned that nothing should disrupt the profitable wool trade. At a personal level, achieving stability, let alone making a fortune, was a precarious business for free settlers in New South Wales who had arrived since the penal colony ended. Wilkie vividly portrays their interrelated land speculation, business opportunism, profits and bankruptcies, particularly on the Central Coast where Edward Hargraves was active. “Duchene, Hargraves and their claims about gold form a picaresque narrative of people surviving on their wits. Infused with Wilkie’s humour and founded on deep scholarly research, it is a treasure trove of detail. For the specialist like this reviewer, every morsel of information is relished and potentially valuable. For instance, Wilkie’s examination of European settlement on the Central Coast not only casts light on the tenor of Australian society in the forties, it also provides useful context for understanding early land speculation in New Zealand. 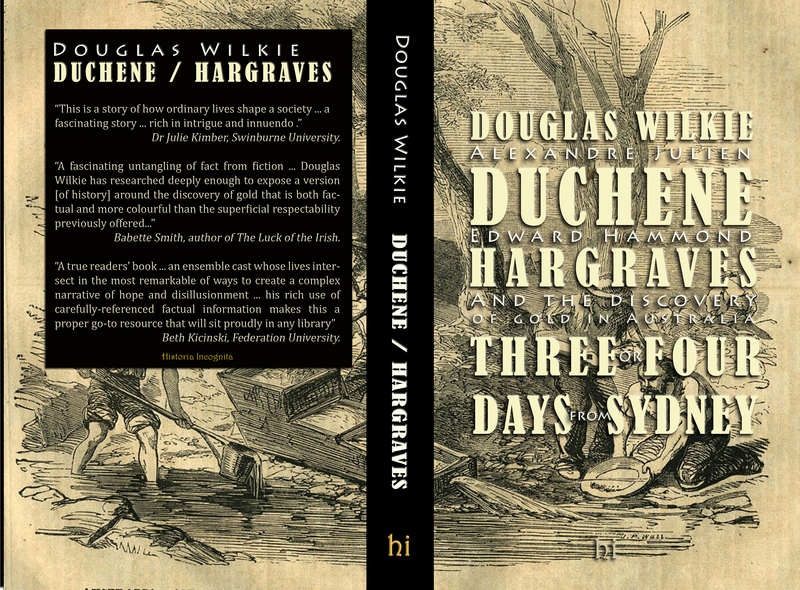 “Douglas Wilkie’s book is an intricate portrait of the parallel lives of two men who would play a significant role in the gold rushes on the east coast of Australia: Alexandre Julien Duchene, unheralded and largely unknown; and Edward Hammond Hargraves, a controversial figure, whose name remains etched in the school books of the nation. In tracing their lives, Wilkie delivers to us a vast portrait of the European personalities who populated the early colonies of eastern Australia, among them prostitutes and politicians, petty villains and political prisoners. Wilkie begins by unpicking long accepted elements of Hargraves’ biography—laying bare, in minute detail, contradictions in his story and offering up alternatives to its distortions. In doing so we see Hargraves as both fabulist and opportunist, a man on the make intent on leaving his mark. The story moves to Duchene, a Frenchman transported to the colonies, and documents his attempts first to be reunited with his wife, and second, to make his fortune. Through dogged archival research, Wilkie broadens his focus and by examining the connections between these two otherwise unconnected men we can discern the complicated lives of early settlers, the vagaries and misfortunes, and the opportunities of dubious integrity offered up by the colonial project. This is a story of how ordinary lives shape a society and how differing political realities shape the fortunes of ordinary lives. It is a fascinating story for a number of reasons, not least because of where this takes the reader: its geographical scope extends from the streets and court rooms of Britain, to the colonies of Australia and New Zealand, and to the gold rushes in North America. “Duchene/Hargraves is a true readers’ book. And not just any old readers, but those who seek to lose themselves in the dark corners of intrigue. This is not the typical dry history of the genesis of Australia’s industrial heritage, but an absorbing “Who Dunnit?” styled unfolding of the past. What is revealed is an ensemble cast whose lives intersect in the most remarkable of ways to create a complex narrative of hope and disillusionment. Like all truly memorable crime thrillers Duchene/Hargraves resolves the central storyline through carefully constructed reveals, but happily leaves several incidental moments of the story unresolved. The reader is left with possibilities of more. “This book is a firm move away from histories of the first and the greatest to stories of people who were just doing what people do. In Alexandre Duchene we see the way in which “the other” has become an integral part of us; and the sensitive re-presentation of the recognisable figure of Edward Hargraves subtly interrogates the role of such diabolical heroes in the Australian identity. Reviewed by Derek Abbott: ‘Discovering the discovery of gold’ (review of Wilkie), Honest History, 3 April 2017 . Duchene/Hargraves (ISBN: 9781366781116) can be purchased here for $25 AU plus postage.